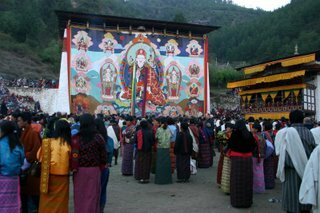 On the last day of the Paro Tsechu, the Thondrol is unfolded. The Thondrol is a huge painting that is maybe 8 by 16 meters. It's huge. It gets unfolded around 4am and is removed before it is hit by the first sun ray. 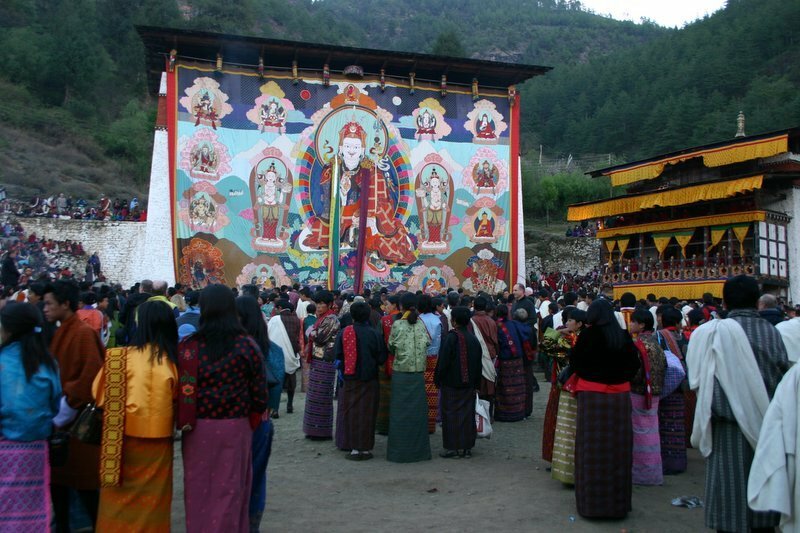 Bhutanese people line up and get a blessing from the painting. The unfolding of the Thondrol was Thursday morning. I was invited to join the family of one of the IT lecturers here at the NIE Paro and we were walking up to the square behind the Dzong. The square was packed with folks and to get a blessing, you had to go into a really crowded area. I remained a bit outside of the most crowded spots and observed the scene. Staying in a new environment and culture, it is difficult to always act in a correct way. I'm sure that I'm insulting people now and then. Sometimes I realize that I'm taking things with the wrong hand, that I'm asking questions the wrong way around, or that I'm just reacting to questions in the wrong way. I realize soon after I have done it - but by the time I have realized it, it has already happened and you can't undo it. Sometimes, I could kick myself a few times every hour, but probably that's just the learning process that you have to go through. It'll take a bit of time to get adjusted and to learn. I'm happy that I'll be staying in Bhutan for four months; this gives me definitely time to get some learning done. I hope that I didn't insult anybody during my time at the Tsechu. Wednesday morning, I went fully dressed up; the last time I have worn those clothes was probably at Coni & Tiisli's wedding. Because an NC hat doesn't match a fully dressed sam, I decided to just forget about the stupid hat - the sun won't be that strong. At the Tsechu, I was the only western guy that was fully dressed up. Was a bit strange; but it is a sign of respect - finally, I'm not staying in Bhutan as a tourist but rather as a person that should respect the local culture. Weather was really nice, the sun was burning, and I couldn't find a place in the shades from which I could have observed the dances. This had the result that after a short period of time, I was badly burned. So I returned back to my place on the NIE campus and changed to a bit more casual clothes; this time with NC hat. After having returned to the Tsechu, I stayed there all afternoon long and observed the dances and the folks hanging around. It was windy and rather dusty; so I was quite happy that I changed to casual clothes. Tomorrow, I'll be moving to Samtse. It's strange, but I already feel a bit sad that I have to leave NIE Paro. I had a good time here and met a ton of good folks. But I'm sure, it'll be fun to stay at NIE Samtse; so I'm looking forward to get in contact with those folks. As a last thing, let me mention a pretty exciting event this evening: A truck full of computers arrived at the NIE Paro. This is part of the new computer lab and trainees helped to move them to the lab. I started helping out but they kind of felt that I shouldn't be doing physical work; as a ICT specialist (the teachers didn't help out either...). I tried to ignore that (because I was pretty excited about all those new computers) but the guy loading off the computers didn't want to let me carry one of the computers. So I kind of stupidly was standing around while the trainees were doing the work.